On October 27, 2016, just over a month after university lecturer Rhoda Bharath asked a series of questions of Trinidad and Tobago's president on Facebook Live  regarding allegations of financial impropriety and misconduct in public office, she held a press conference in Port of Spain. The event was also streamed on Facebook Live . In her statement to the media, Bharath zeroed in on the issue of the housing allowance of TT $28,000 (approximately US $4,180) per month that President Anthony Carmona received from July 2013 until May 2015, while living in state housing. She explained that she had instructed her attorney, Justin Phelps, to seek the advice of a senior attorney in the UK with regard to documents she had in her possession, to determine whether there were grounds for a criminal investigation into misconduct in public office on the part of the president, his secretary at the time and the then Chief Personnel Officer (CPO). Bharath reported the matter  to Harold Phillips, the then acting Commissioner of Police, but is yet to receive a response either from Phillips or from Stephen Williams, his replacement. On November 11, 2016 attorney Phelps sent a follow-up letter to the Commissioner on Bharath's behalf. This incident marks the first time in the history of Trinidad and Tobago—and, according to Bharath, the entire Commonwealth—in which a citizen has asked for an investigation into an individual who holds such high public office. Bharath has also made it clear that her writing to the police does not suggest the people cited are guilty of any offence, but she believes there is sufficient evidence to warrant investigation. The guidelines of the country's Civil Service Act  states that officers who are not provided with government accommodation are entitled to receive a special housing allowance. 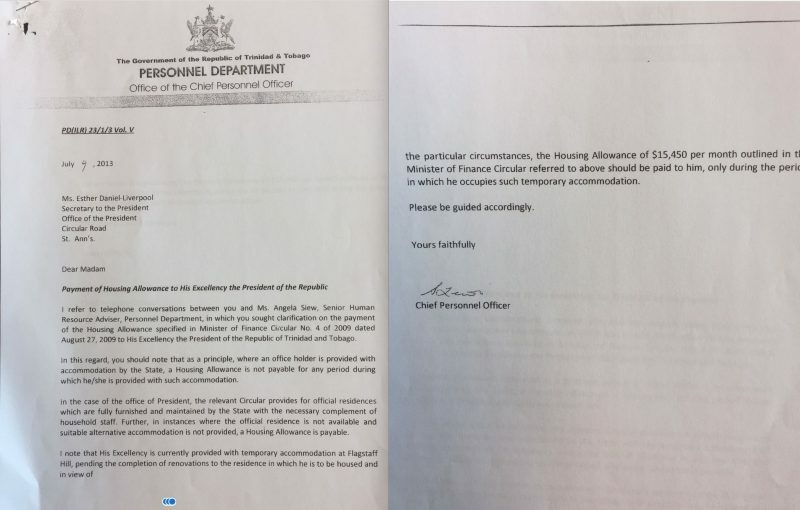 In a public statement  on September 28, 2016, President Carmona maintained that the guidelines were different for the head of state, arguing that the SRC mandate says he was entitled to the $28,000 per month allowance because the state-funding housing he occupied was sub-par. The housing allowance matter is not new. Kits provided to media at Bharath's press conference included copies of a letter dated July 2013 from the then Chief Personnel Office  to President Carmona's secretary, which advised that “as a principle, where an office holder is provided with accommodation by the State, a Housing Allowance is not payable for an period during which he/she is provided with such accommodation.” In that same letter the CPO approved a housing allowance of TT $15,450 (approximately us $2,305) “only during the period in which [the president] occupies such temporary accommodation”. The figure was later increased retroactively to the $28,000 per month. Screengrab of the CPO's letter to the president's secretary, one of the documents upon which the Queen's Counsel based her opinion. In 2014, there were newspaper editorials calling for an explanation . Senior Counsel (SC) Martin Daly publicly questioned the legal grounds on which the housing allowance was granted, and former head of the public service, Reginald Dumas, called  the president's receipt of both state housing and the allowance “ethically reprehensible”. More recently, however, parliament and civil society organisations have—with a few exceptions— remained silent, with Bharath one of the only people continuing to pursue the issue. On November 15, 2016, however, activist group Fixin’ T&T  sent a letter to the president asking him to answer another question  that Bharath initially raised, namely, whether his mother-in-law was ever employed at the Office of the President. If so, the group has called for the president's resignation on grounds of nepotism. Global Voices also spoke with Dion Abdool, the recently installed chair of the Trinidad and Tobago Transparency Institute  (TTTI), the local chapter of the global anti-corruption coalition, Transparency International . Abdool said that coming out of the concerns raised about several ministries in the 2014/2015 Auditor General's Report, the TTTI has embarked upon a project in conjunction with the AG's office, the Ministry of Finance and other stakeholders. The steering committee will submit a report by March 30, 2017, after which they will share its findings and recommendations with the national community. Abdool believes that social media — along with the country's parliament and civil society — are the appropriate platforms on which to keep the issue of the housing allowance alive and says that he continues to look forward to the president, as the head of state, providing answers. Should additional evidence be revealed, he says, the TTTI would be willing to lend its voice to the issue.